AlgoM DICOM Viewer delivers the power of our DICOM imaging in a simple, installation-free application. 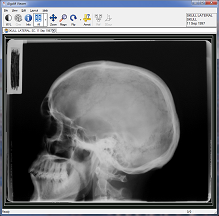 You can open DICOM files, analyze them with the most common tools (window/level, zoom, etc. ), save DICOM images in multimedia formats (bmp, jpg, avi, PowerPoint) or even anonymize your DICOM data. The viewer does not have the DICOM networking power of AlgoM Workstation, but is ideal for simple and convenient DICOM file viewing. No installation required: Run it on your PC or keep it on your flash drive. Take it anywhere at no cost. Windows XP and higher. Copyright © 2019 AlgoM. All rights reserved.